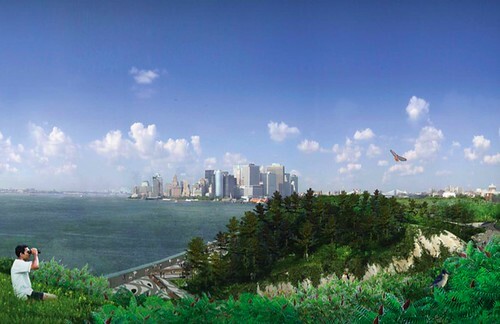 Even with last week’s heat wave making it feel like July in the city, it will still be seven weeks before that oasis in New York Harbor, Governor’s Island, opens for the season on June 5. 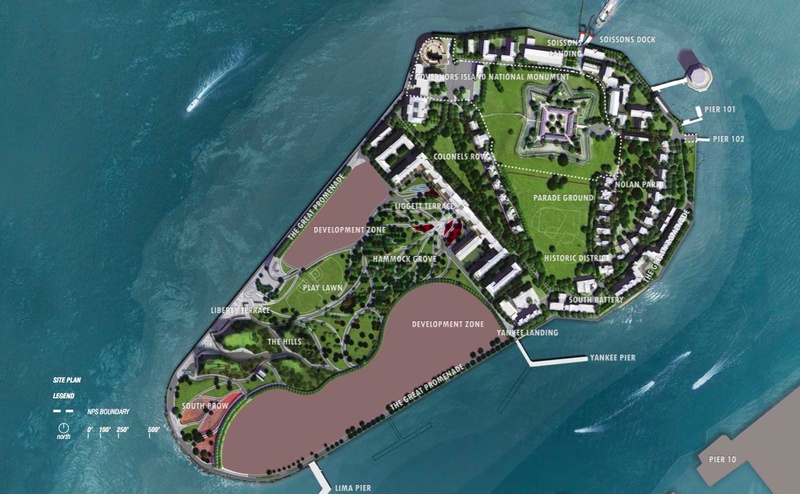 But there’s still plenty of reason to celebrate like summer’s here, as the city reached its anticipated deal with the state for control of the 172-acre island yesterday. The city will now be responsible for the development and operation of all but 22 acres of the former Coast Guard base purchased for $1 from the federal government in 2003, whose National Parks Service remains responsible for a small historic district on the northern section of the island. This paved the way for the rather quiet unveiling today of the 87-acre final master plan designed by West 8, Rogers Marvel, Diller Scofidio + Renfro, Mathews Nielsen, and Urban Design+, which had been under lock in key since last spring, when the proposal was completed but held up by all the fighting over the island’s, uh, governance. 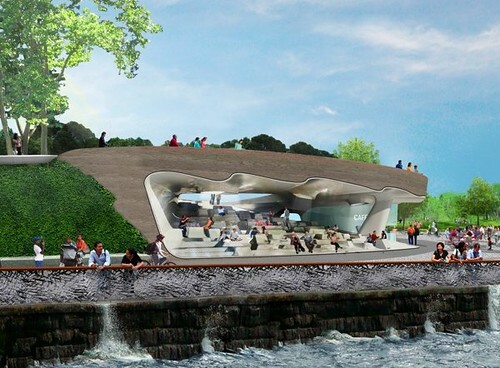 The Shell, a mobius-like amphitheater space designed by Diller Scofidio + Renfro. 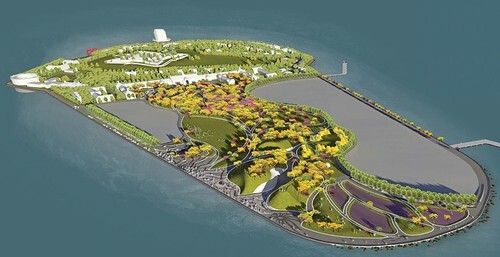 The thrust of the problem was largely a disagreement about how to best spend dwindling state funds, which led to upstate ambivalence toward the flashy park project—Governors Island almost didn’t even open in 2009 after Governor Paterson initially withheld about a third of the $18 million annual operating budget. 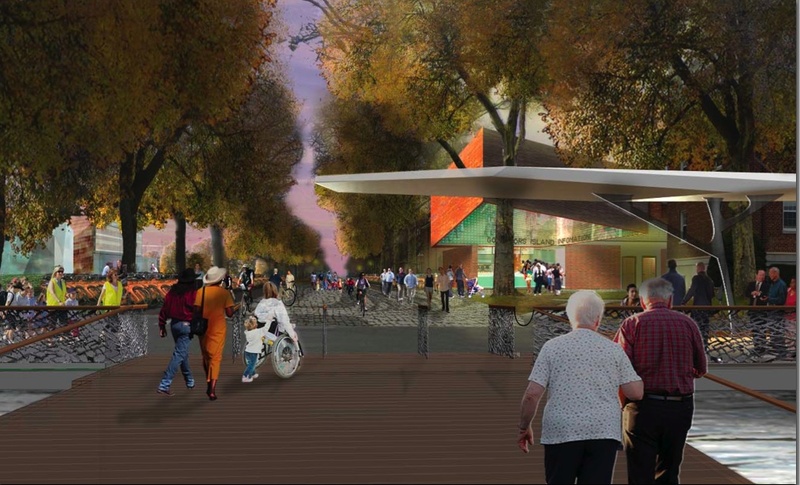 At the time, the design team had put in more than a year of work, with an expected unveiling in May that never came. 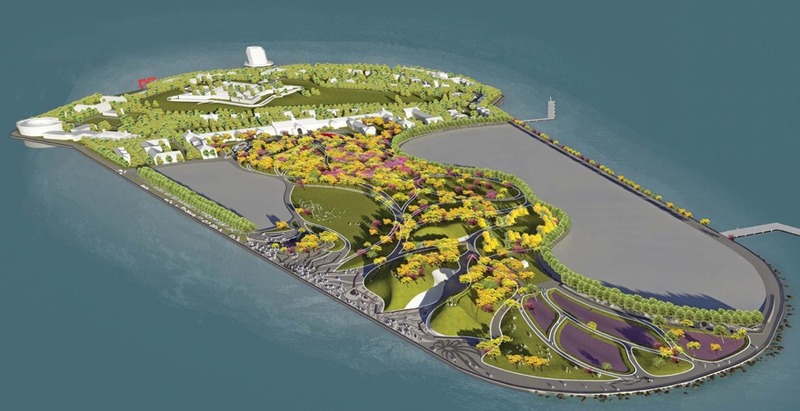 In a wide-ranging piece in The New Yorker last August, Nick Paumgarten revealed that the designs had actually been under lock and key since then on the island, and now they’ve finally been unveiled online at a new-ish site. New-ish because they’re are posts dating from May 8, 2009, confirming the presumed unveiling, along with another from April 8, 2010, suggesting that yesterday’s announcement may have been worked out in advance, though we had also heard it was a rather abrupt agreement, hence the press conference scheduled for 6 o’clock on a Sunday night. As for the plan itself, in the past it was expected to cost upwards of $100 million to execute, though it will no doubt be higher in the end, plus another $30 million annually to operate, though that money would come from an outside source, quite possibly NYU dorms or biotech labs, though an agreement with the feds stipulates no residential development or casinos. 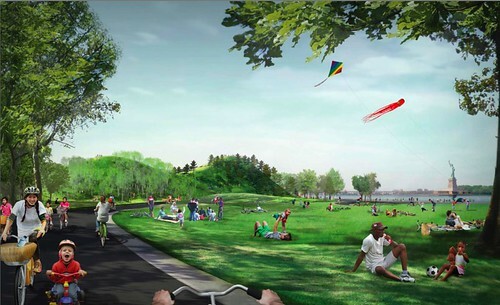 All this for a 40-acres of park land plus the 90-acre historic island to the north, all encompassed in a 2.2-mile promenade. We’ll have more to say about the designs in a day or two, but until then you can kick around the aforementioned website, which is almost as impressive as the place itself. The island is a haven for cyclists, with one headed toward the Hills, a series of 25-story high mounds meant to provide unparralleled views of the surrounding city. Looking back on Lower Manhattan from the Hills.